Boxers are intellegent and require firm handling from an early age. They will respond by being well behaved and can be taught to do tricks. They do however need to be exercised daily and are not a suitable breed for professional people who are away from home most of the day. They do make good family pets and will tolerate young children very well and will be a very good addition to a family providing they are part of the family.Boxers are playful dogs and can be boisterous and should therefore not be exercised or played with immeditaely after they have eaten as they can twist their gut which can be fatal if not diagnosed and treated by a vet. Boxer dogs are best feed twice a day. Once in the morning and once in the late afternoon. They should be allowed to digest their food before any form of excercise. When young they should not be over exercised to ensure that growing bones and joints are not damaged. 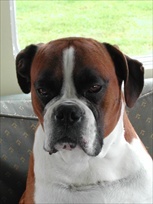 This site is dedicated to the continued existance of the Boxer dog. Surely one of the best dogs God ever created. I maybe biased as a Boxer dog owner? But here you will find all the information on keeping your Boxer dog healthy and give it every option to live a full, active and happy life. 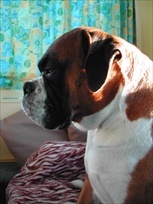 A Boxer is a family orientated dog and needs company. Don't get one if you just fancy one or need a dog. There are other breeds that are less demanding and remember Boxers are WORKING dog which means you have to take them out to exercise them! Copyright © 2006 Healthyboxerdog, All rights reserved.